These sausage and cheese appetizer bites literally take 5 minutes to put together, 15 to bake and 30 seconds to devour. Rich, cheesy, and ridiculously addicting. 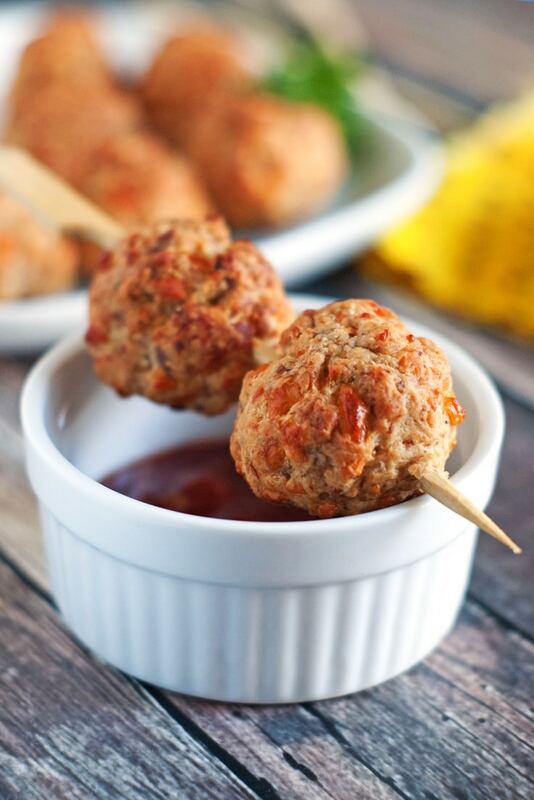 You guys, make these Sausage and Cheese Appetizer Bites, NOW! Holy fudgesicles. Thanksgiving is almost officially 2 weeks away and I’m hosting. HOSTING. I’m acting like it’s a really big deal for me, but it’s not. I actually really like it and I’m excited to have both mine and the hubs parents coming to share it with us. I’ve started on the menu but it’s going to be pretty simple so I’m not too worried about it. How about you, are you hosting this year? Have you started planning? If not, I have some excellent news. I’ve teamed up with a big group of bloggers and we’re all sharing a Thanksgiving recipe this week. If you search #blogsgivingdinner in our good friend Google, you’ll be able to find all the posts and get started on that planning. I thought I’d share this recipe for Sausage and Cheese Bites as my contribution to #blogsgivingdinner because it’s the perfect little appetizer before the big meal. Not only are they tasty, they are so simple to throw together and they can even be made up ahead of time and baked just before you’re ready to serve them. This is one of those super quirky recipes that has been floating around for a long time. If I hadn’t tried these at a party I never would have even thought twice about making them because, I’ll be honest, the ingredients sound weird. But they are SO good. 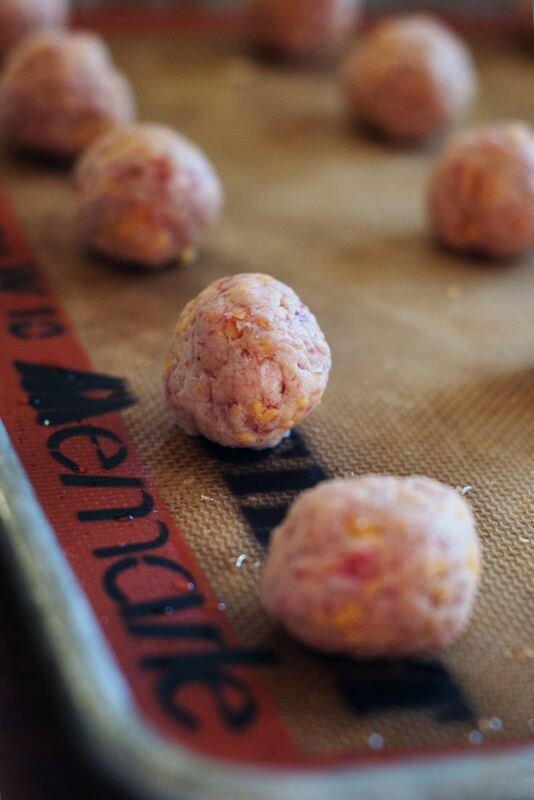 Like little bready, sausage-y, meatballs. And the sauce pushes them over the edge. And they take 3 ingredients, 5 if you include making the sauce which you MUST make. 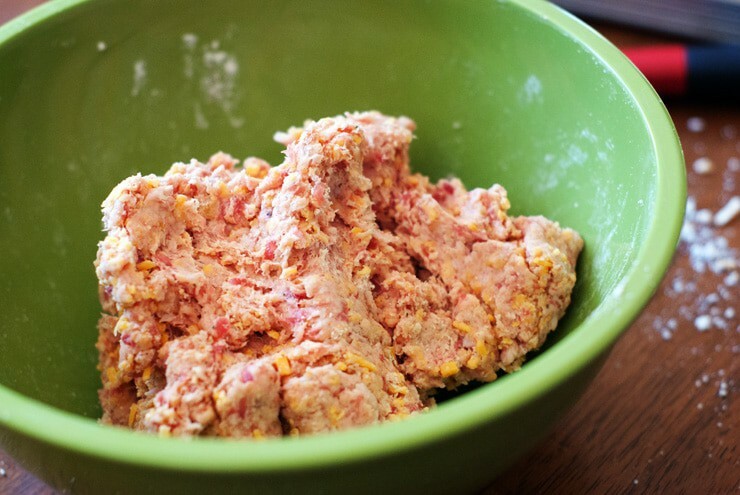 Let’s Make Sausage and Cheese Appetizer Bites! You’ll start with some sausage. Regular breakfast sausage works great, but HOT breakfast sausage is awesome too if you like a little kick. 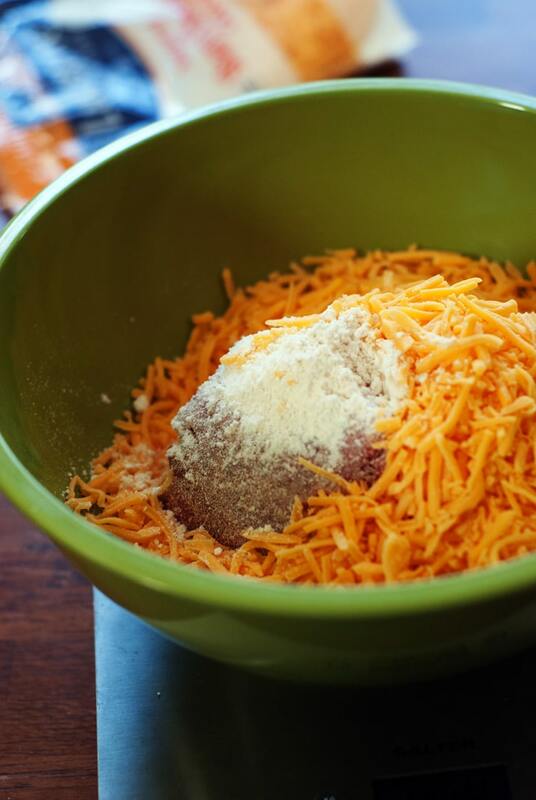 To the sausage you’ll add some dry bisquick and sharp cheddar. You’ll start mixing it by hand but you’ll soon learn it’s much more efficient to just use your hands. This stuff gets stiff. I use a cookie scoop to portion them out into perfect little balls and then roll them smooth with my hands. Lay them out on a lined baking sheet and bake @ 400 degrees for about 15 minutes or until they are golden brown. They are best when they are hot out of the oven so wait until you’re ready to eat to throw them in. If you’re making them up ahead of time just roll them into balls, cover with plastic wrap and put in the fridge until ready to bake. For the sauce, THIS SAUCE, you need two ingredients: Orange marmalade, and chili sauce. And by chili sauce I mean the kind you find in the ketchup aisle, NOT the Asian foods section. The sauce totally takes the bites from good to amazing. 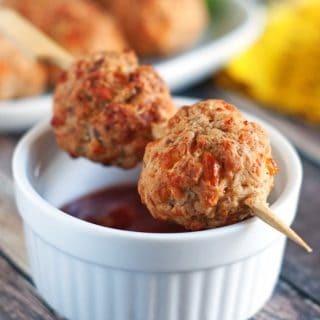 It’s a spin on the popular grape jelly and chili sauce meatball sauce recipe and is the perfect compliment to these little bites. It’s sweet and a little bit bitter from the orange rind and the chili sauce just rounds it out. 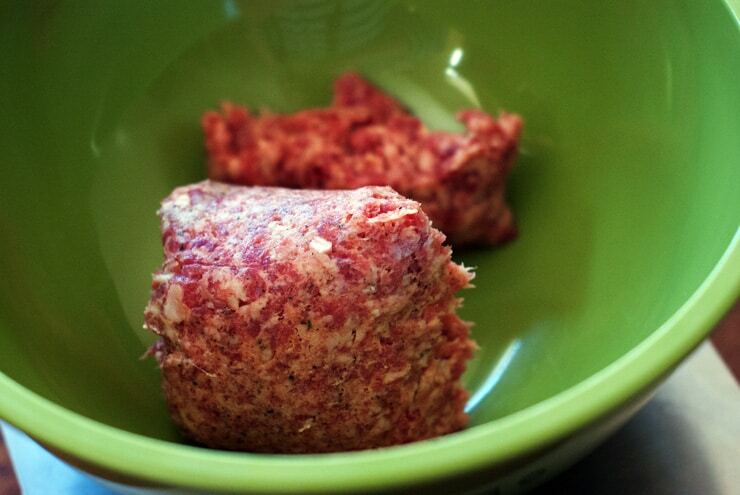 1/2 pounds raw breakfast sausage hot or regular. 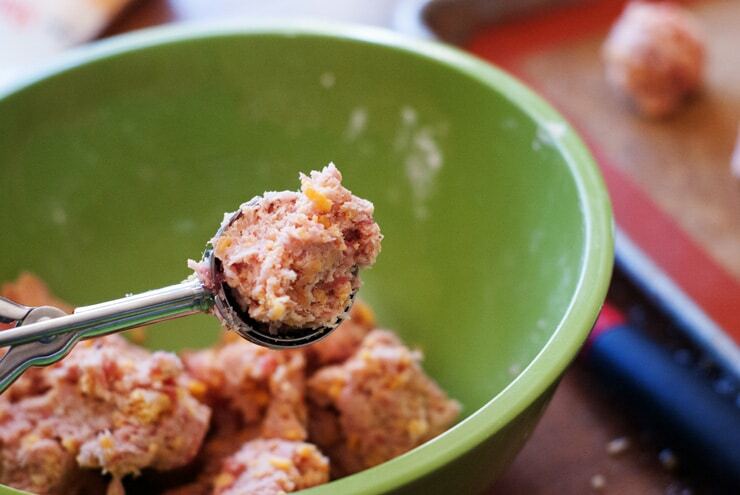 Combine raw sausage and Bisquick and cheese, using hands or a stand mixer to combine. The mixture will be very stiff. Scoop into 2" balls and roll. Place on a lined baking sheet and bake for 15 minutes or until golden brown. Combine the orange marmalade and chili sauce in a small bowl and microwave until warm. Serve with the hot sausage and cheese bites.